This is a very good mask. Very high quality, gentle and effective. Loved the product, I have very oily skin and it absorbed all the excess oil, amazing. It smells great and it helps a lot. I really liked this product. It was easy to apply and felt great against my skin. I noticed that my skin was appeared and felt more moisturized after using the mask. 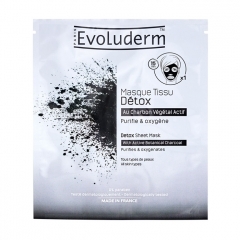 Lorsque l'on ouvre le produit la texture du produit sur le masque surprend et le masque n'est pas très pratique à déplier. I think the product was really good and I would love to see a non-paper mask version of it. I could definitely feel it working when I applied it and my skin felt very smooth afterwards. Overall, I really enjoyed the product and would love to try more from the company! Good product, easy to use and effective.